You won’t have to wait 79,000+ years for the first day of Chanukah to occur on Thanksgiving again. See an analysis of the Hebrew and Gregorian calendars at http://blog.pjvoice.com/diary/3612 (including a mnemonic for when the leap years occur in the 19-year Hebrew cycle, using piano keys). This year, Thanksgiving is November 28; and the first day of Chanukah, 25 Kislev, is from Wednesday evening, November 27 until the evening of Thursday, November 28. In 2070, Thanksgiving is Thursday, November 27, and the first day of Chanukah starts that evening and continues into Friday. The upshot is that we only have to wait until 2070 to celebrate the first day of Chanukah on Thanksgiving again. 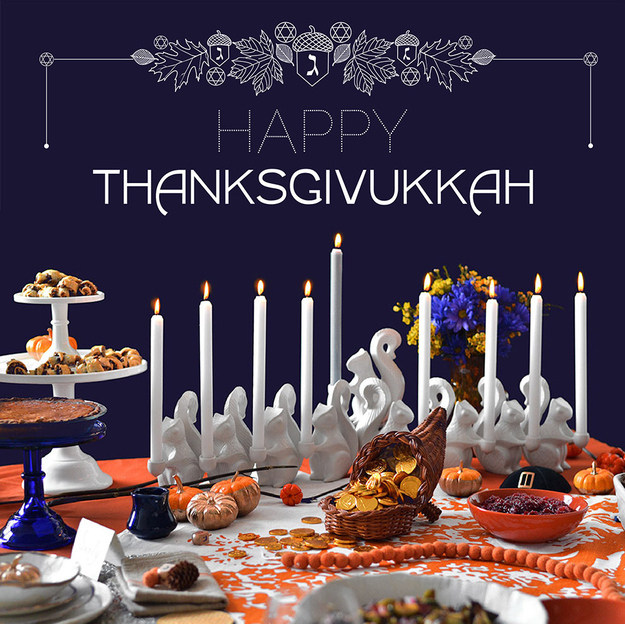 We have 57 years to come up with a more euphonious melding of “Chanukah” and “Thanksgiving” than “Thanksgivukkah.” I have heard “Chanukiving” or “Chanugiving” suggested (thanks, Judy B.!). I’m actually not excited about the confluence of Thanksgiving and Chanukah this year. In my family, we’ve had multiplex celebrations on Thanksgiving for years. Our mother’s birthday was November 26, mine’s a week later, and Chanukah sometimes came around then, so we’d get together in Merion and celebrate everything at once. This year is our first Thanksgiving without our mother. Dinner will also be sparsely populated. Happily, my dear husband will still be making us a delicious Thanksgiving feast. Back to the Joseph story. This week’s portion zips along briskly. Pharaoh dreams of 7 skinny cows swallowing 7 fat ones yet staying skinny, and then he dreams of 7 withered ears of grain swallowing 7 full ears of grain yet remaining withered. The wine steward tells Pharaoh about Joseph. Shaven and cleaned up, Joseph modestly interprets the dreams and throws in a plan for dealing with the imminent 7 years of plenty and 7subsequent years of famine. (Veterans of corporate America know you should never identify a problem without offering a solution, preferably one that will make money for the company.) Impressed, Pharaoh makes Joseph Viceroy, second only to him. Two years into the famine, Joseph’s 10 older brothers come to Egypt to buy food, on Jacob’s orders. Recognizing them, Joseph decides to test them (this reads sort of like a cat “testing” a mouse) and holds Shimon hostage, while secretly returning their money, until they return with Benjamin. Jacob, still very much in charge, eventually lets them return, with some nice little gifts and Benjamin. Joseph frames Benjamin by planting his silver chalice in Benjamin’s sack. The portion ends with a cliffhanger: Will the brothers be less cold-hearted this time than they were toward Joseph all those years ago? Or will they leave Benjamin in Egypt as Joseph’s slave? AN ITALIAN CORPORATION: You have two cows but you don’t know where they are. You break for lunch. A MEXICAN CORPORATION: You think you have two cows, but you don’t know what a cow looks like. You take a nap. A SWISS CORPORATION: You have 5000 cows, none of which belongs to you. You charge for storing them for others. Cow: Cows in dreams represent wealth, happiness and femininity. – Source: http://www.myjellybean.com. 8. May be the first time in history that the 2nd night of Chanukah might have the best gifts – thank you, Black-Friday! 5. Seriously, how cool of a band name is “Squanto Latka”? 2. Forget Jelly-Filled, how about Turkey Filled Donuts! 1. Everyone’s happy, since there are only one, and not two, painfully annoying filled-family get-togethers to suffer through – a Thanksgivukah Miracle!! In the New World, Judah and the Pilgrims settled in an old temple on Plymouth Rock. There, they prepared to roast a turkey, and they resolved to keep the turkey moist. It might sound like an insurmountable task, to keep a bird juicy in an unfamiliar and hostile land, but the Pilgrims were known for their Calvinist work ethic, and for their high-quality kosher poultry. But when the Pilgrims prepared to eat the turkey that night, they found that there was only a small pitcher of gravy inside the temple. The contents of the pitcher, they could see, would not be sufficient to moisten their turkey. This greatly concerned the Pilgrims, for if they could not keep their turkey moist, their mothers-in-law would never stop kvetching about the dried-out turkey they’d prepared. The turkey was never dry, she’d say, when they came to her house and let her do the cooking. And so the Pilgrims decided that they should pray to God for gravy, and they sent a letter inviting the good Rabbi Squanto, who was extremely helpful, and also unusually skilled at growing maize, for a rabbi, to lead them in their prayers. But a letter soon came back from Rabbi Squanto’s uncle, Mordechai, who was a doctor, informing them that the good and helpful Rabbi Squanto had died a horrible death. The Pilgrims felt guilty about Rabbi Squanto’s death. When they had seen Squanto looking ill last Shabbat, they had told him it was probably just indigestion or, at the very worst, lactose intolerance. The Pilgrims took their black hats with the buckles from their heads in a gesture of respect for Rabbi Squanto. A Pilgrim named Saul Berenson recited the Mourner’s Kaddish. Then the Pilgrims remembered the turkey mishegas. They continued to pray to God, and, by a miracle of miracles, the modest gravy boat that had been almost empty suddenly ranneth over with copious amounts of gravy. The Pilgrims feasted that night, and the next night, and the gravy lasted not for one or two or even three days but for eight days and eight nights, and the Pilgrims ate leftovers until they never wanted to look at or even smell turkey ever again. Even just thinking about turkey made the Pilgrims slightly nauseous, to be honest. The Pilgrims knew that the gravy lasting eight days proved that God had again blessed the people of Temple Plymouth Rock, and taken them under His protection. In memory of this miracle, they designated eight days each November for an annual Thanksgivvukah celebration. But having no further appetite for turkey at the time, the Pilgrims planned that their next ritualized seasonal meal, in the springtime, would be lighter. Unleavened bread, they thought. Unleavened bread suddenly sounded very appetizing to the Pilgrims. Besides, without Rabbi Squanto around, it seemed unlikely that the Pilgrims would be able to find yeast, let alone keep growing maize. In fact, now that they thought about it, they might want to skip the fuss and just buy a prepared turkey next year. Or order in Chinese, if there were any decent takeout places in the neighborhood. Maybe see a movie. The Pilgrims told themselves they’d have to start exploring. This entry was posted in Uncategorized and tagged 7 years of plenty, Benjamin, Chanukah, dreams, famine, Genesis, Joseph, Joseph's brothers, Pharaoh, Thanksgivukkah. Bookmark the permalink.